The profession of chiropractic dates back to 1895. However, the earliest healers in world history understood the relationship between health, spine and nerves. 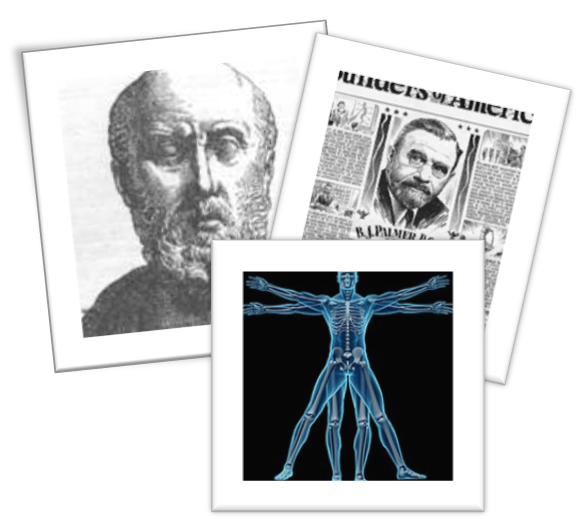 It is said that Hippocrates, the father of medicine and a Greek physician taught his students back in 400’s BC – “Get knowledge of the spine, for this is the requisite for many diseases." Herodotus, a contemporary of Hippocrates, gained fame curing diseases by correcting spinal abnormalities through therapeutic exercises. If the patient was too weak to exercise, Herodotus would manipulate the patient's spine. Treatment of the spine was still crudely and misunderstood until Daniel David (D.D.) Palmer discovered spinal subluxation and develop the philosophy of chiropractic. Palmer believed that since the nervous system controls and coordinates the healthy operation of all organs in the body and that spinal alignment would strengthen the body’s natural defenses against disease. D.D. Palmer’s son Bartlett Joshua (B.J.) was also enthusiastic about the chiropractic philosophy his father had developed and continued this work. In 1902, B.J. graduated from the Palmer school started by father. Over the years he developed his father’s basic philosophy into a clearly defined system of care and was influential in getting chiropractic recognized as a licensed profession. Although the profession has advanced tremendously since the days of D.D. Palmer and his son Bartlett the basic tenets and understanding of chiropractic as a drug-free method of correcting vertebral subluxations in order to remove nerve interference still stand.